Purpose. The aims of this study were to 1) compare the metabolic power demand of straight-line and change of direction (COD) sprints including 45° or 90°-turns, and 2) examine the relation between estimated metabolic demands and muscular activity throughout the 3 phases of COD-sprints. Methods. Twelve highly-trained soccer players performed one 25-m and three 20-m sprints, either in straight-line or with one 45º- or 90º-COD. Sprints were monitored with 2 synchronized 100-Hz laser guns to assess players’ velocities before, during and after the COD. Acceleration and deceleration were derived from changes in speed over time (Figure 1). Metabolic power was estimated based on di Prampero’s approach (2005). Electromyography amplitude (RMS) of 2 lower limb muscles was measured. The expected energy expenditure during time-adjusted straight-line sprints (matching COD sprints time) was also calculated. Results. As shown in Figure 2, locomotor-dependant metabolic demand was largely lower with COD (90°, 142.1±15.0 J.kg-1) compared with time-adjusted (effect size, ES = -3.0; 193.2±18.7 J.kg-1) and non-adjusted straight-line sprints (ES = -1.7; 168.4±18.2 J.kg-1). Metabolic power requirement was angle-dependent, moderately lower for 90º-COD vs. 45º-COD sprint (ES = -1.0; 149.5±12.9 J.kg-1). Conversely, the RMS was slightly– (45°, ES = +0.5; +2.1%, 90% confidence limits (±3.6) for vastus lateralis muscle (VL)) to-largely (90°, ES = +1.6; +6.1 (3.3%) for VL) greater for COD-sprints. 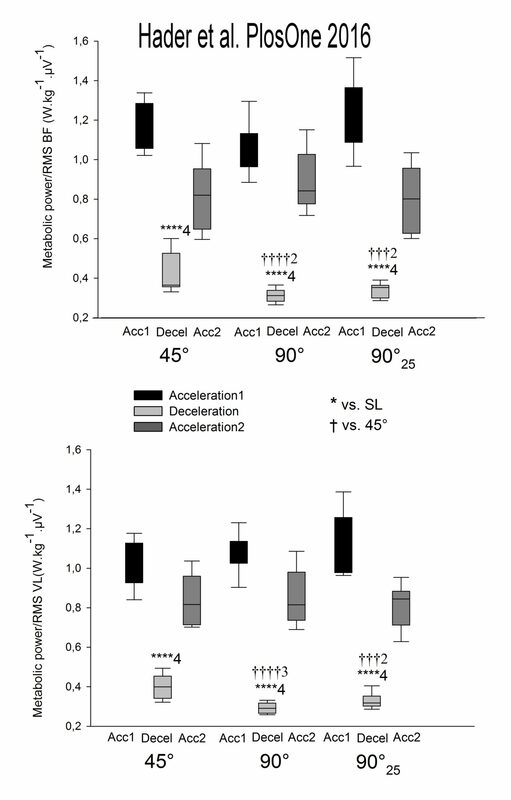 Metabolic power/RMS ratio was 2 to 4 times lower during deceleration than acceleration phases (Figure 7). Conclusion. 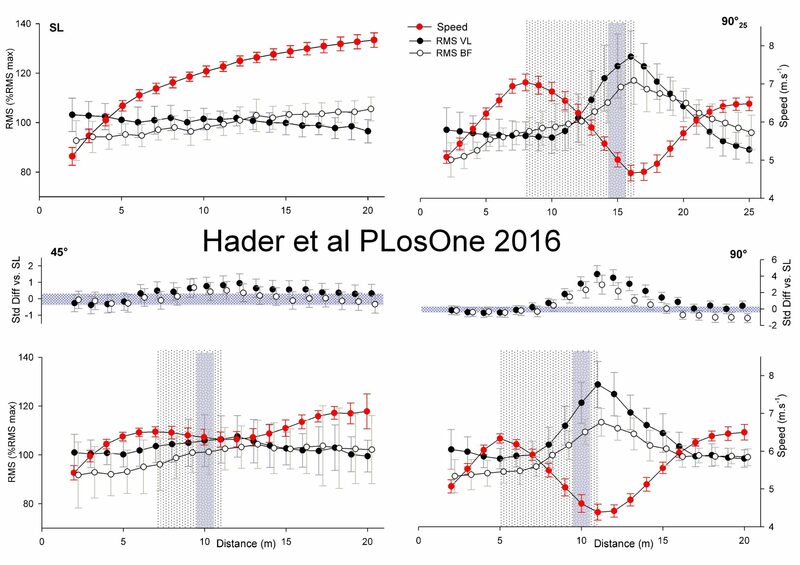 Present results show that COD-sprints are largely less metabolically demanding than linear sprints. 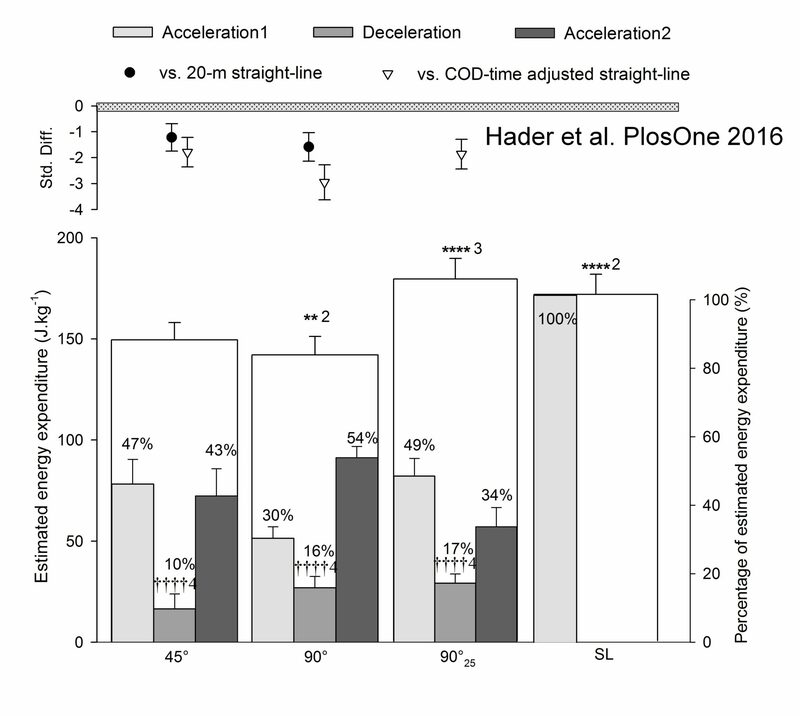 This may be related to the very low metabolic demand associated with the deceleration phase during COD-sprints that may not be compensated by the increased requirement of the reacceleration phase. These results also highlight the dissociation between metabolic and muscle activity demands during COD-sprints, which questions the use of metabolic power as a single measure of running load in soccer. Key words: Energy demand, muscular activity, electromyography amplitude, acceleration, deceleration, sprint, braking forces, running load. Fig. 1: Electromyography amplitude (RMS) of vastus lateralis and biceps femoris muscles and speed profiles during sprints with (45° or 90°) or without (i.e., straight-line, SL) one change of direction (COD). 90°25: 25-m sprint with one 90°-COD. The medial panel represents the standardized difference (Std Diff) of RMS between COD- and SL- sprints. The number of ‘*’ and ‘†’ refers to possible, likely, very likely and almost certain difference versus straight-line and 45°-COD sprints, respectively. Fig. 2: Estimated energy expenditure of sprints with (45° or 90°) or without (i.e., straight-line, SL) one change of direction (COD); 90°25: 25-m sprint with one 90°-COD. The upper panel represents the standardized difference (Std Diff) between COD- and SL sprints. Since 90°25 vs. 20-m SL sprints could not be properly compared (i.e., differences in both running time and distance), their standardized difference (black circle) was not provided. The number of ‘*’ and ‘†’ refers to possible, likely, very likely and almost certain between-sprints differences versus the 45°-COD sprint trial, and within-sprint differences vs. the acceleration phase, respectively. The associated number refers to the magnitude of the difference, with 1 standing for small, 2 for moderate, 3 for large and 4 for very large magnitude.